Planning a trip to the Hawaiian Islands? 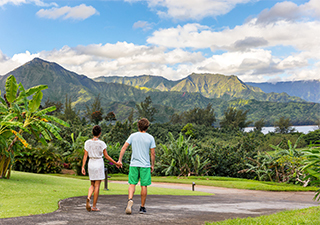 Kauai offers tons of outdoor activities. Oahu's Honolulu draws in the crowds to Waikiki Beach. The Big Island's Kona is dubbed as “coffee country” and Maui is a treat for the foodie. Planning to island hop on your trip to Hawaii? Call us to learn more about inter-island flights, or to add them to your itinerary. Contact us today about your Hawaii vacation and we'll get started on planning your trip! Heading to Honolulu? Considered the heart of Hawaii and the largest city on the island of Oahu, Honolulu offers lots to do. Famous Waikiki Beach is known for surfing and snorkelling. Diamond Head Volcano, Honolulu Zoo and Pearl Harbor are among Honolulu’s other must-see attractions. 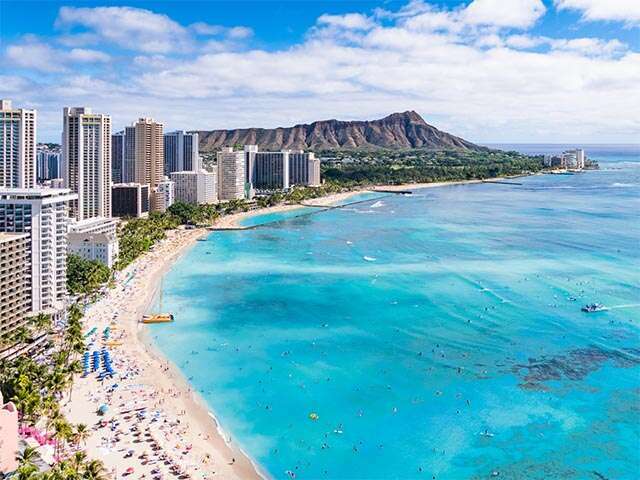 Oahu also offers much more than just Honolulu, rent a car and experience snorkelling at Hanauma Bay or discovering local life on the island's North Shore. From the pastries of Wailuku to the farm-to-table cuisine of Lahaina, Maui is a favourite for foodies. The second largest of the Hawaiian Islands is also known for surfing, snorkelling, whale watching, the scenic Hana Highway and Iao Valley State Park, home to a protruding green-mantled volcanic rock called the Iao Needle. Kona is located on the west coast of Hawaii Island (the Big Island). The historic Kailua Village, a vibrant seaside town, is a must for shopping, dining and nightlife. If you’re a coffee lover, check out Holualoa, Kona’s coffee country. If you’re going to Kona for the great outdoors, then explore Kohala Waterfalls, Waikoloa Beach, Kilauea Volcano or take a manta ray boat tour. 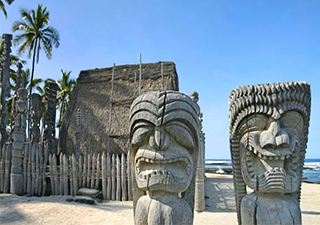 For Hawaiian cultural history, visit Pu'uhonua O Hōnaunau National Historical Park. Kauai, the Garden Isle, is the oldest of the main Hawaiian Islands and has a culture entrenched in the natural world and a deep commitment to preserving the environment. Here, you can participate in a traditional Hawaiian Luau, kayak along the Wailua River, cycle through Waimea Canyon or zipline in Poipu. Book your Hawaiian vacation with UNIGLOBE Travel today! *Save up to 25% on select Hawaii packages. Offer is combinable with UNIGLOBE Travel's exclusive offer - Save an additional $50 per person or $200 per family. New Air Canada Vacations package bookings only. Select departure dates only. Minimum 3-night stay required. Applicable to Economy Class only. Not applicable to groups. Up to 25% savings is reflected in the Air Canada Vacations pricing. Savings applies to the package price before taxes and fees. An additional $50 per person savings is applicable only when booked through UNIGLOBE Travel. Subject to change without notice. Subject to availability at time of booking. Percentage savings offer expires May 19, 2019. Additional conditions may apply, contact your UNIGLOBE Travel consultant for details. *Save $50 per person or $200 per family. New Air Canada Vacations Hawaii flight + hotel package bookings only. Valid for travel May 1, 2019 to December 31, 2019. Minimum 3-night stay required. Applicable to Economy Class only. Not applicable to groups. Offer is combinable with Air Canada Vacations Hawaii packages early booking savings offer. Offer is only not combinable with Air Canada Vacations savings offer IF travel departs within 90 days of the booking date. Subject to change without notice. Subject to availability at time of booking. UNIGLOBE Travel exclusive savings offer expires April 30, 2019. Additional conditions may apply, contact your UNIGLOBE Travel consultant for details. (1)This promotion corresponds to savings of $50 per person and is based on a family of 2 adults and 2 kids. Save up to $100 per person!